This was yesterday's #tbt review, but I never found the time to finish writing it up. Only 100 more days until Halloween! Soon the shelves will be lined with spooky skull and bat themed EVERYTHING. Sure it's supposed to be seasonal decor and decorations, but if you're a former goth-kid like me, it's the best time of the year to redecorate your home! 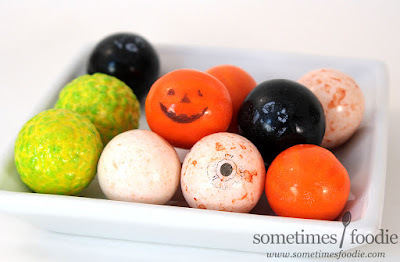 I grabbed a few packages of these spooky Halloween themed gum balls when they went on clearance back in the fall. I've been munching on them here and there, but I'm finally down to my last pack, so I thought it'd be fun to write it up for a #tbt. To me, this one looks the coolest. I love the neon green color and the added texturing. It looks like something rom the Ninja Turtles! Like Ooze gumboils or something. 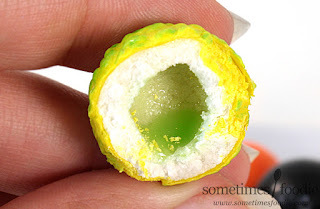 Taking a bite, the center isn't as slime-y as promised, but it does have a nice lime flavor to it. Similar to lime Skittles. This was my favorite visually, but it's flavoring doesn't last ver long. 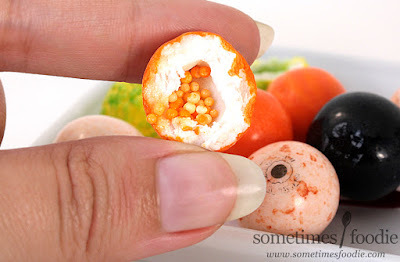 Seedlings was a gum I grew up LOVING but it's really just a gumball with a few sprinkles inside. I love the little pumpkin-face, and the sprinkles add some playful texturing that makes chewing this one vs. the others very different. It's not life changing, but it adds some great variety to this mix. 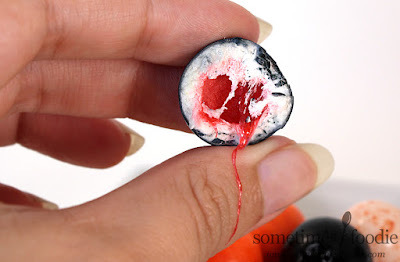 This one is filled with a cherry slime, and I could be crazy, but the gum itself seems to taste like black cherry too. It has the boldest flavor of the bunch, and the black food coloring turns my tongue gray, which I find very fun. Easily my favorite of the bunch as far as taste is concerned. Just your average normal gumball, just printed to look like a little eyeball. No fancy fillings here. I found this to be the most boring to eat, but it does look really cute. I picked up these gumball tubes pretty cheap on holiday clearance, and even though they aren't gourmet or fancy, I really love them and would definitely re-purchase. They'd make a great seasonal candy dish filler! Only if the gum flavor would last a long time. The Count Blacula looks like a sushi roll sort of. It kind of does! The flavor pay off isn't great, but they're so stinking cute that I'd happily repurchase them this Halloween.